A court has ordered the release of former Pakistan prime minister Nawaz Sharif and his daughter two months after they were jailed for corruption. 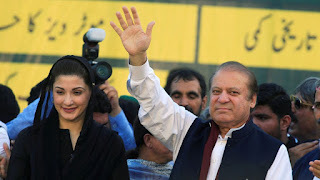 The court suspended the sentences of Sharif and his daughter Maryam after they were convicted in July just before Pakistan held its general election. Both appealed against the sentences and have denied any wrongdoing. Sharif received 10 years for corruption, Maryam was given seven years for abetting a crime and a year for not co-operating and son-in-law Safdar Awan was given a one-year sentence also for not co-operating. Former foreign minister Khawaja Asif, a staunch Sharif ally, said outside the courtroom: "Justice has been served and I congratulate Nawaz Sharif's supporters." The Sharifs' convictions are still under appeal with the same Islamabad High Court but the judge has ruled they should be freed immediately while the case continues.